During the restoration of my first Daimler, the Barker Special Sports HYC 178, I came across an advert for a Hooper Empress, on the same chassis. I purchased the car with the intention of restoring it as soon as I had completed the Special Sports. I have learned that it is a mistake to ‘stack’ projects, by the time I get near to completing the current car, the enthusiasm for the already familiar ‘new’ one has diminished! 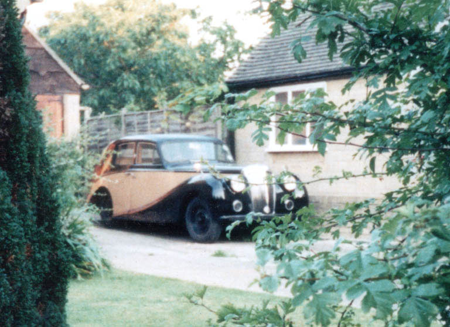 The Empress moved house with me and was towed to various lock up garages, before I eventually accepted the inevitable. I sold it, in the same condition that it was in when I bought it. If I saw it for sale today, I would buy it back and without a doubt, complete its restoration. The Empress line was a very successful style for Hooper and was fitted to the 3 litre, 31/2 litre and DK400 Daimlers, Rolls Royce and Bentley chassis also received this lovely razor edge styling. The Daimler DS420, launched almost 20 years later, took its styling cue from this model. The DB18 Special Sports chassis was the first to receive this treatment and is the prettiest of the Empress cars. From a practical point of view, it does suffer from a rather limited rear seating area compared to other DB18 saloons, this is however, a small price to pay for such style. Although I never drove this particular car, I have subsequently driven a Hooper bodied DB18, its performance was very similar to the Special Sports, although the quality of build and sound deadening reached a higher standard; the entire car feeling even more opulent and luxurious than the Barker and the Consort. Progress felt smoother, probably because of the lack of mechanical noise. The technical detail is identical to the Special Sports, if buying, beware of a rotten body frame, the area around the rear screen and boot had suffered badly on this car, as had the door pillars. The interior trim is exquisite and if in poor condition will cost a small fortune to correctly repair. I would love to own a good example of this model – if you have one for sale please let me know (please complete and submit the form below).